There are a countless number of ways in which gluten free bread can be obtained using a series of ingredients. Depending on your individual taste and health status, you can choose the kind of gluten free flours you want to use. In this section, we will give you a generalized list of ingredients as well as the method in which you can prepare gluten or wheat free bread. 1. Leaving yeast aside, mix the rest of the ingredients together and whisk thoroughly. 2. Make sure all the ingredients including gluten free flours and xanthan gum are mixed properly. 3. Heat the water to about 110 degrees and check the temperature using a digital thermometer. 4. Pour 1½ cups of warm water in a small bowl. Add the yeast to the remaining water in another bowl and set aside. 5. Mix all the wet ingredients in a bowl and whisk well. 6. Now, check for the yeast. Ideally, it should be active and bubbly and should have risen significantly. 7. Add this yeast mixture to the wet ingredients and whisk thoroughly. 8. Pour the dry ingredients’ mixture into your electric mixer. 9. While you still beating this mixture, slowly add the wet ingredients in smaller portions and continue to mix well. The end mixture should resemble the batter of a thick cake. 10. Create a warm environment for your bread to rise by warming your oven up to 200 degrees. 11. Place the dough into the loaf pan after you’ve sprayed it a non-stick cooking spray and then pour the bread dough into a pan. 12. Take a rubber spatula and shape the dough into a loaf. 13.Take a piece of plastic wrap and spray it with non-stick cooking spray on one side. Placing the sprayed side down, carefully and loosely, put the wrap around the loaf pan and keep the pan in the warmed oven. 14. Set the timer for around 50 minutes. 15. Check that the bread has risen approximately 1 inch above the pan. 16. Once done, take the wrap off and heat the oven up to 350 degrees. Alternatively, you can also use a good quality gluten free bread maker machine for making gluten-free bread. 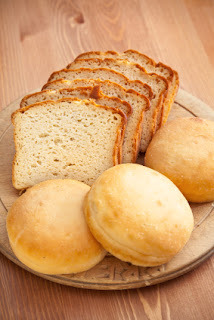 You can also choose from the vast range of gluten free bread premixes available for this purpose. What is a gluten free diet and how does it work? Gluten-Free and Yeast-Free: Are they the Same?